Due to constant rise in sea level, Ashar Chor's natives are already moving to other parts of the country. Climate change has reduced the island's size and is jeopardizing the natives' lives and livelihoods. Ashar Chor, a spit of land marooned in the Bay of Bengal, lies in a region that is highly prone to natural disaster. The dry fish workers start their work early in the morning. Each fishing boat leaves the shore of Ashar Chor to fish for 15-20 days. When they come back, there's more to be done. They unload the fish and carry it away in buckets, to process and dry. Every day, six-year-old Danesh catches fish. He is too young to be able to do this work properly, but fate dictates that he must. Child labor is strictly discouraged, but still it goes on in this community, with its economy based on dried fish. The children get some 40 taka (56 US cents) per day. Female workers work alongside with men on Ashar Chor. But, as in many other parts of the world, they are paid less. During his many years working here, 52-year-old Karim Ali had seen a lot, like natural disasters and kidnappings after which people are committed to forced labor. "Once, one of my co-workers was kidnapped and never came back," says Ali. "I never know when it is going to happen to me. We have no guarantee of life here." The only means of income is dry fish, which is given the maximum priority. On the small island of Ashar Chor, the community maximizes most of its space to dry the fish. Without any modern fish treatment plant, buckets full of fishes are rinsed in pools of fresh water and laid on raffia mats to dry for up to six days. The Bay of Bengal is the key to survival for the island's people, most making their living through fish. 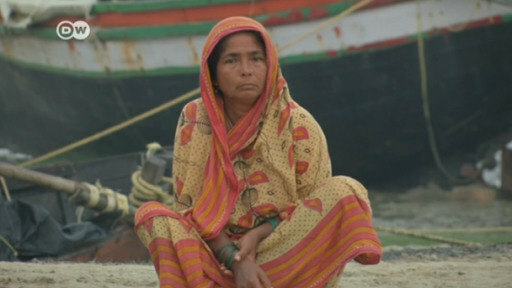 But the sea has also destroyed their lives through flooding and cyclones. Part of the island is flooded every day as the high tide rises up above the barriers and floods fishing farms and cultivated land. Cyclone Sidr in 2007 was a major killer. The Red Cross believes that 900,000 families, roughly seven million people, were affected by the devastation. Of the total lives lost, 40 percent are believed to be children. The hard-working dry fish community lives in tough conditions. The government does not provide them with cyclone shelters, nor are there any sanitation projects. They live in small shanty homes. Bangladesh is on the front line of climate change, as its low-lying delta farmlands face surging floods. But floating gardens – a traditional form of hydroponics – is offering a lifeline to some farming families.